Located in idyllic Citra, this 65+ acre farm will easily accommodate an equestrian of any discipline whether its breeding, training or showing horses. An convenient drive to both Ocala and Gainesville, it is easy to be attracted to the natural beauty of the landscape as well as being close to main roads, parks and riding trails. 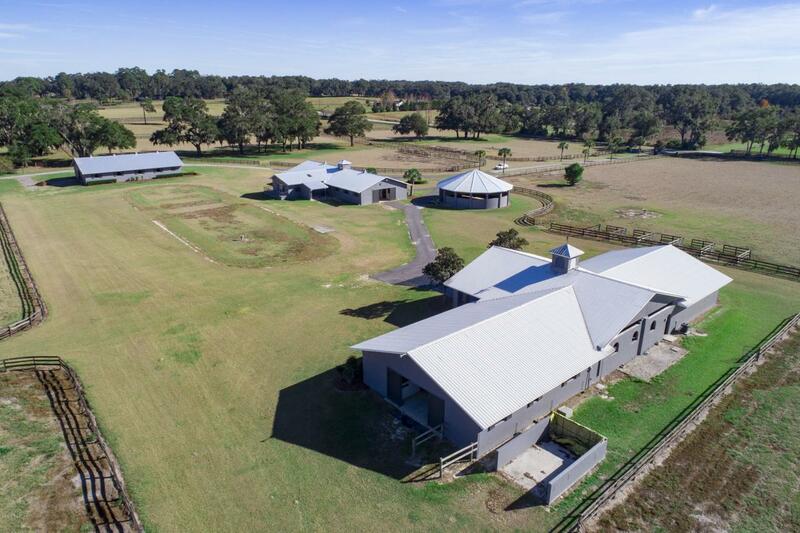 This sprawling property includes three barns totaling 22 stalls, a covered show ring, gallop track and 19 shaded lush board-fenced paddocks. Main barn is equipped with a large grooming area and office. There is a stallion barn with stalls, breeding shed, lab as well as a manager's office. RV Parking area.The Main residence offers a large fireplace, huge island kitchen, screened in pool &spa with a summer kitchen. Oversized master suite and bath. Close by is a 2nd guest house with added apartment and a 3 bay detached garage with game room, a guest room with full bath and new sauna. ALL NEW ROOFS AND NEW A/C FOR ALL BUILDINGS. It's your time now to enjoy quiet and peaceful rides in the early morning or watch beautiful sunsets from your patio. Listing provided courtesy of Romel Camacho Team of Sellstate Next Generation Realty.